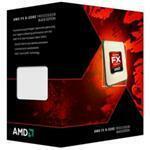 AMD FX Processors unlock maximum, unrestrained processing performance for extreme responsiveness you can see and feel. The industry's first and only native 8-core desktop processor for unmatched multitasking and pure core performance with all new "Bulldozer" architecture. New 32 nanometer die shrink designed to reduce leakage for improved efficiency, increased clock rate headroom and better thermals. Can deliver more cores and more performance without raising the power requirements.